Surprisingly, the key to fixing this is actually in your head. If you touch the remote to your head while pressing the button, you can unlock your car from a further distance. For even better results, hold it under your chin and open your mouth. According to radio engineer Tim Pozar, you're essentially turning your skull into an antenna. 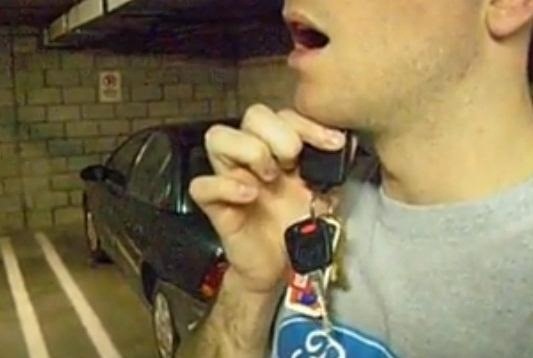 The fluids in your head make it a good enough conductor to actually increase the range of your key fob. Still skeptical? Watch the video below to see the trick in action. So, if you want to make your car remote more effective, just use your head. You may get some funny looks, but it just might save you a trip outside the next time your car alarm goes off. I've done this for years and my friends always look at me funny, gives you an extra boost! This was demonstrated by Jeremy Clarkson on Top Gear in the UK... Used frequently since! been doing this since 1996 open or closed mouth works the same...one looks less stupid. Very nice! Who would have "Thunk it."